DONE! And for a guy who normally loathes his own work, I'm surprised. It's pretty good. You might be interested to know that this very F-105F survived the Vietnam War, which, if you read the stats in a prior post, is a rare thing. According to one statistician, an F-105 pilot in 1967 Vietnam had a 1:4 chance in completing his required tour of 100 missions. One could say that "301" was fortunate to have made it. However, I don't think the word "fortunate" could be used to describe what happened to Leo. Barely a week and a half after the mission that would result in Leo's Medal of Honor, he and Weapons Officer Harold Johnson experienced a dramatic shock. They were shot down and became Prisoners of War. 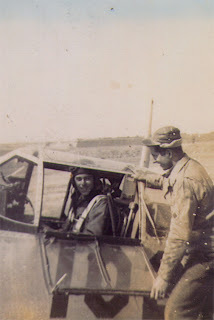 I've only talked to a handfull of pilots who have been POWs and every time, it's a gobsmack. I. Cannot. Imagine. And when it came time to talk to Leo about his time in captivity, I blanked. Having just finished his biography the night before our first conversation (click here), I was at a loss for words. It seemed in terrible taste to ask, "So, Leo. Tell me again about being tortured." Rehashing Leo's POW horrors do no good anyway. It's common knowledge that people can be horrible - do the fine points really matter?! Plus I had a finite amount of time with the guy. I wasn't going to waste it by dignifying depravity with attention. Anyway...in the course of events, we got to the point of signing the prints of my artwork and he asked me if I would mind if he signed them with the words, "God bless you." Well, of course not! He could have signed them with his favorite potato salad recipe if he wanted. But at first, I was a little uninspired at what appeared to be a hackneyed platitude. Kind of like how most of us say, "Fine" after being asked how we're doing, regardless if we're truly "Fine" or not. It's white noise, right? Ok. Stop reading for a second and grab a pencil or pen. Now look at the little picture below. You've probably figured out it's the alphabet, missing the letter "K." That's not important right now*. It's actually a code key. Got your pencil/pen ready? Ok. We're going to use the little graph to get a message from Leo. Find the "G". It's the second letter in the second row, second column. So, take your pen/pencil and tap the edge of your desk twice. "TAP TAP," then wait a moment and tap again. "TAP TAP." You just tapped out the letter "G."
Next, find the "B" - first row, second column. "TAP," wait a moment, "TAP TAP." 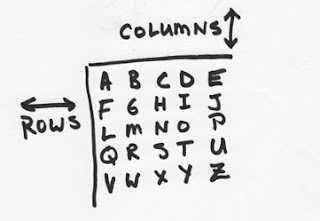 Now, find the "U" - fourth row, fifth column. "TAP TAP TAP TAP," wait... "TAP TAP TAP TAP TAP." Now. Imagine yourself in a small concrete cell, alone. The air is dank, the floor is hard and the place reeks of human excretion. There is no bed, there is no window. The only people you've seen in the past year are those that inflict physical and mental pain. "Tomorrow" means more of the same. And then, a series of rhythmic clicks hits your senses - maybe through your ears, maybe through the concrete into your bruised skin. It doesn't matter. You know you're not...alone. Or, as Leo knew - "God Bless U. Good Night." In spite of the hell they were in, the American POWs could still look beyond. To me at least, that is Faith. Amazing. And it gets even more so because no one went into the infamous "Hanoi Hilton" (the nickname for the prison) knowing the POW tap-tap code. It was taught - through the walls, without words, by others that were never seen. And for those teachers of the tap-code? When they were caught, they were brutalized again. Imagine it - to be in total want, and yet risk what little you have in order to stay true. If this story impacted you like it did me, you've now been gobsmacked, too. GBU, Leo. I'm grateful for your example and hope to have learned from it. *The letter C stood for K in the POW code. But, I only get to "know" most of the people here for a few blips in their life. However. I have to write this...today, one of the men here died...and I knew him beyond the heroic moments of combat. To me, he was not only a highly decorated, courageous leader, he was a Great man. This is personal...and it's self-indulgent to write this without going into the details, but that's what I'm going to do because the necessary words just aren't available to write. However, if you've ever had someone Great in your life, you know what I'm experiencing. If you haven't...as bad as this feels for me right now, I suggest you find someone like Bill Creech. A few years ago, I published a little story about him. You can download the .pdf by clicking here. There are a lot of pictures, so don't be put-off by the 12meg download. "Kingfish One" is nearing completion. I've got a long list of tiny details to work through - it'll go fast from here but you'll notice a big difference between now and finish. So don't look too close. But very soon, this F-105F will be brought back to life as she flew on April 19, 1967 - the day that would afford Leo the chance to earn our nation's highest military award - the Congressional Medal of Honor. Whoever designed the actual Medal, nailed the design. It's at once, awesome and awkward, capturing the true spirit of the kind of gallantry and selflessness its intended to mark. Wrapped close around the neck, the muted blue ribbon and hefty gold star leave no mistake of its importance. But no photograph I've seen shows anyone quite comfortable wearing it - which makes total sense considering the circumstances that justify its presence. No one has an easy-time of getting a Medal of Honor. And since the Medal of Honor is never part of a "goal," those that are so awarded are struck with a "why me?" that compels them to share it - at least spiritually - with others. For me, the inspiring gleam in this stunning story is Leo's leadership. This mission was not a single act of bravery but a long chain of do-die decisions that made the needs of others the supreme priority. And on that afternoon, Leo was the urgent thing that saves the soul - hope. Ok. Fast-forward to October, 1973 and the photo below. 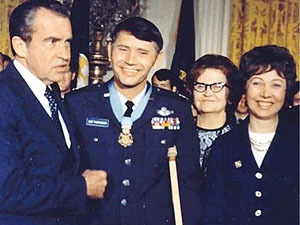 It's Leo's Medal of Honor ceremony with President Nixon. For those of you who are quick with numbers, you'll notice the six-year span between 1967 and 1973. That's a long time to wait to get a medal. For those of you who are observant, you'll notice the crutch. And that's Leo's mom and his wife. They've just put six very hard years behind them. Photo via Minnesota Public Radio, used with permission of Leo Thorsness. Have a look. Not much, but it's getting there. The shape's about right though - and man, what a shape! That thing's a knife. And a knife that flies at Mach 2, too. If I were on the ground and saw that slicing towards me, I'd know something serious was going to happen. The F-105 "Thunderchief" was designed in the '50s as a fighter-bomber by the Republic Aircraft Company. 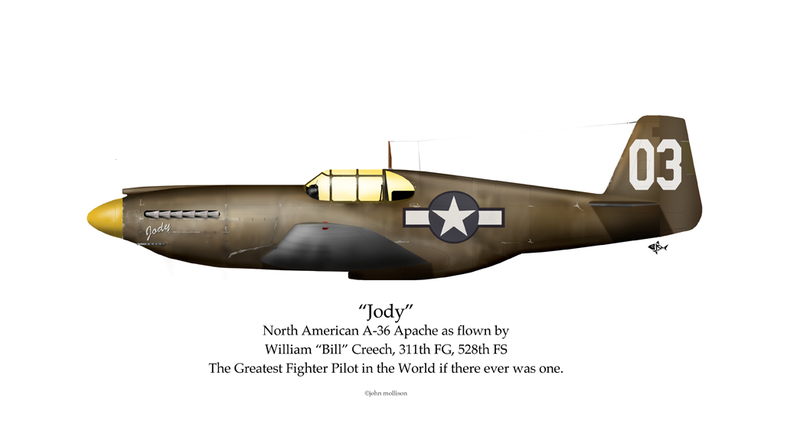 They were the same folk that created the iconic WW2 airplane of the same mission, the P-47 "Thunderbolt." However, the F-105's load-carrying capability was easily over TEN TIMES its older brother. And four times faster, too. Evolution was marked by continually raised limits back then. But while the airframe eggheads were reveling in the innovations of the jet age, there were others who were focusing and sharpening another WW2-era invention (actually 1930s). Radar. 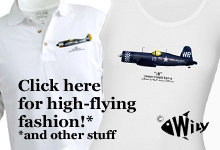 And, in Vietnam, Radar and Thunderchief would collide in terrible fashion. For most Westerners who've learned about the North Vietnamese fighting forces, the picture comes to mind of tiny primitives dressed in black pajamas armed with sharpened sticks and stolen rifles. And cone-shaped hats. That may have been true a time or two (more so for Hollywood types). But make no mistake about it - the North Vietnamese fighting forces were serious, resourceful and wanting - not to meet the American tech - but to beat the American tech. And the only really clear lead the Americans had in "Tech" was their aerial forces. If you were a communist revolutionary tired of seeing American iron in the sky, who'd you call to make it stop? Russia provided the North Vietnamese forces with their top-secret "Dvina" missile system. Guided by radar, the Dvina - commonly known as a SAM; short for surface-to-air-missile - would acquire a target and launch its missile. It was straight-forward to operate and extremely difficult to counter; exactly the kind of thing the North Vietnamese needed. I made the illustration above "to-scale" so you could get an idea of the distances. And yeah, that's an F-105 getting hit in the nose. Bear in mind, it wasn't the first time our Generals had to scratch their chins about Dvina - one brought down a U-2 spy plane over Russia during the infamous "Gary Powers" incident in 1960. In the five years since, the system had been improved to be even more lethal to jets flying at lower altitudes and at greater speeds, too. SAM sites sprouted up around the critical target areas around Hanoi. Anyway, so what to do about these SAMs? Enter the "Wild Weasels." Their mission was to fly ahead of the attack formation, PURPOSELY trigger a SAM launch so their own smaller Shrike missile could get a lock (again via radar) on the launch site and blow it up. Makes total sense. Until you wonder, "Hey. What about the missile that's been launched?" Leo told me, "Well. You've got three, four seconds." "To do exactly what, Leo?" Simple. Like telling someone who's going swimming with seals, "Don't get attacked by a shark." At the next progress update, I'll describe Leo's second-most-memorable Wild Weasel mission. Of the 144 F-105F/G "Wild Weasels" built, 38 were lost to combat. A 26% loss rate. Go ahead and whistle softly. Would you buy a car with a 26% crash rate? But get this - of the 833 F-105s built (including prototypes), 320 were lost to combat. A 38% loss rate. Go ahead and mumble whatever you mumble when you realize such awful odds. *Combining data from my own library, the sometimes questionable Wikipedia and pilot's own words, I try to come up with my own reasonable averages. In some cases, the numbers are spot-on. In others, they are up for conjecture. Use these figures as a rule but don't base your Master's Thesis on them.